It's set 1,000 years before the first game, during the time of the Old Empire. 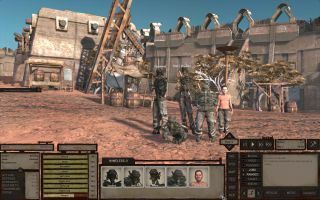 Kenshi took developer Lo-Fi Games around 12 years to create, and it finally left Early Access in December. It's great—just give our Kenshi review a read—and more than a bit weird. And a follow-up to the massive post-apocalyptic sandbox is already in development. The Kenshi 2 announcement was made without much fanfare, hidden away in the Steam updates and announcements forum (cheers, ResetEra). Lo-Fi was planning on working in peace without the pressure that comes from announcing a new game, but pressure from another direction made the developer reconsider. "Our original plan was to keep the new project quiet so we could work on it without public pressure and then do a big press release when we had something to show," studio founder Chris Hunt explains. "However it seems lots of people are getting confused or angry about us not still tinkering with Kenshi or leaving the world of Kenshi behind, so I'm going to go ahead and announce early what we are working on now, as I think it will put most people at ease." Kenshi 2 will be set before the first game, a whole 1,000 years earlier, letting Lo-Fi dig into the world's history. This is when the Old Empire was apparently top dog. That's the ancient civilisation whose ruins you'll find scattered around Kenshi, so presumably we'll be taking a trip back to before the apocalypse. It will use the same engine as the first game, though it's being upgraded for performance. The upgrade will benefit the original Kenshi, too, as it will be applied as a free update. Other features could also be shared across the games. "Why keep the same engine? Because a completely new engine would break everything and take another million years to finish," says Hunt. "By sticking with the same code we are making the decision to prioritise gameplay instead of graphics. (Not to mention a much faster release date)." What that release date will be is still a mystery. Probably sooner than 2030, though.